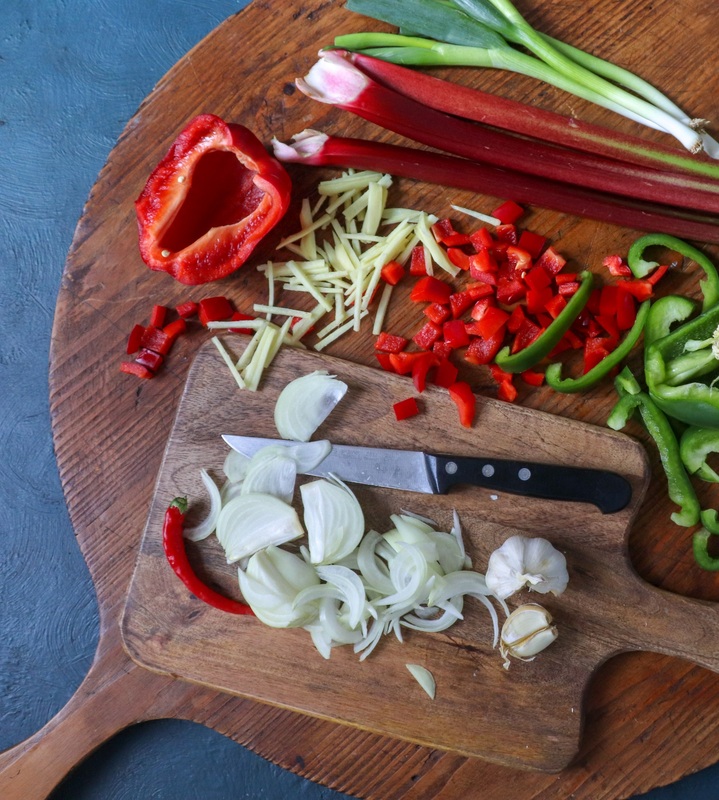 Pies and tarts and crumbles are wonderful, but rhubarb works brilliantly in savoury recipes too, so I sprang to attention with quivering whiskers when a friend told me she’d used it in a sweet and sour stir-fry. Tina Black runs the Masak Masak Malaysian Supper Club in Devon (Instagram: @tinab.kitchen) and is allergic to pineapple, which is why she subbed the English garden favourite. I’m not, but I am militantly opposed to putting pineapple on pizzas and I find it too sweet in the Chinese takeaway classic, so I was keen to try her alternative. I also wanted to take Aspall’s new raw cyder vinegar with honey for a test drive, and it seemed like the perfect opportunity. (Disclaimer: I was given the vinegar to try out.) If you can’t source any, use normal cider vinegar or rice wine vinegar and add more sugar or honey. The result is unashamedly Anglo-Chinese. I scrapped the green peppers shown in the ingredients pic as I thought they fought the rhubarb, but otherwise I think it works well. You can substitute chicken for pork, if you prefer. To increase the quantities to feed four people, use 500g of pork fillet and perhaps a whole red pepper, but keep the remaining ingredients the same. We ate this with plain boiled rice cooked with a tiny pinch of turmeric, but egg fried rice is also good. Whisk together the marinade ingredients, add the cubed pork, cover and set aside for at least half an hour or up to a couple of hours. In another bowl, whisk together the sauce ingredients. Cover and put aside. Heat a tablespoon of olive oil in a large frying pan and add the rhubarb batons in a single layer. Cook for about a minute and a half, keeping them moving. Add a heaped tablespoon of soft light brown sugar, toss and cook for about minute more. You want them to have tenderised but still to have some bite. If they start breaking up, you’ve gone too far. Whip them off the heat immediately. Scoop into a bowl and set aside. Make sure you’ve prepped all the veg before you start cooking the main event, because it will only take minutes. Remove the pork from its marinade and pat dry. Put a tablespoon of cornflour in a bowl and toss the pork to coat. Put a tablespoon of vegetable oil (I used extra virgin rapeseed) and a teaspoon of sesame oil in a wok and stir-fry the pork on a medium-high heat for three or four minutes, until golden brown. Remove and keep to one side. Add the onion, garlic, pepper and ginger to the wok and stir-fry for two minutes on medium-high. Give the sauce a quick whisk in case the cornflour has separated, then pour it into the pan. Bring to the boil, reduce the heat and simmer for three or four minutes until thick. Add the pork back to the pan, toss to coat, then carefully stir through the rhubarb. Serve over rice, garnished with the sliced spring onion and chilli (if using). 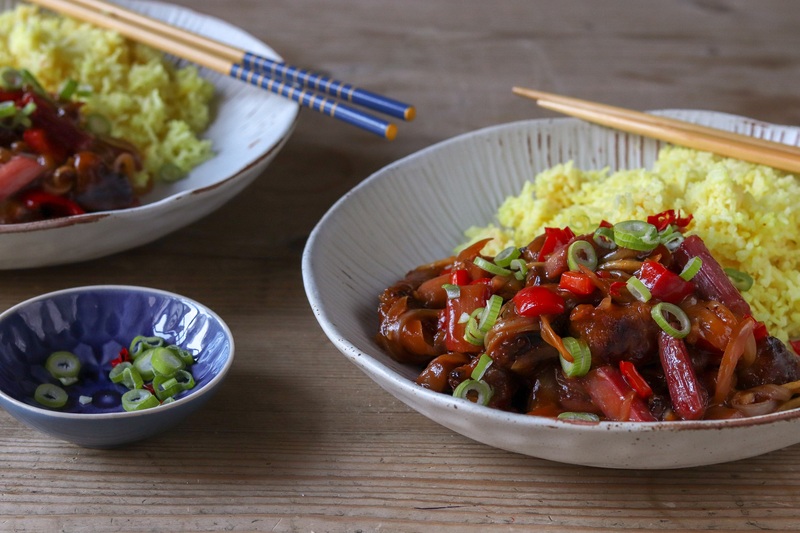 This entry was posted in Mains, Pork, ham and bacon and tagged spring recipes, sweet and sour pork, sweet and sour pork with rhubarb by Linda Duffin. Bookmark the permalink. Sounds perfect! Looks utterly delicious. Thank you so much for the mention! Living at the bottom of the world and literally in the Asian food zone, I oft have difficulties in accommodating European-Asian fusion in recipes presented. To my remembrance have never used rhubarb in my sweet and sour, but, looking t the recipe -= it fits well . . .for us the dish is somewhat 60s-70s . . . but not the way you have made it . . . ) ! I belie one calls it retro these days 🙂 ! It’s clear you have never visited a Chinese restaurant in a provincial British town! 😀 Sweet and sour pork is what I and most Brits probably first encountered as Chinese food and very popular it was, and still is. Rhubarb is never used as a rule, it’s usually pineapple, as discussed in the piece. But I like to use stuff from the garden wherever possible and rhubarb is terrific in savoury recipes. Rhubarb apart, this tastes close to what I grew up eating (although rather less gloopy). Whether it approximates anything you might eat in China (or indeed Australia) is another matter. You are so correct 🙂 ! I daresay the good old sweet and sour is still on many of the ‘caf’ menus in the suburbs ! It seems to be somewhat of a laughter-stock on Aussie blogs . . . ! Methinks historical continuance seems to play a large part: Here we began with Chinese – no provinces to the time as now!- in my uni years, progressed to Thai and Japanese because of our travels, picked up Malaysian ad Indonesian to become part of the Oz cuisine . . . and, for the last decade or more, it is all Vietnamese or nothing 🙂 ! Yes: the combo of Asian and French is fantastic ! Most of our holidays are taken in that part of the world, most cooking classes are taken in Vietnam and then Thailand . . . sweet and sour . . . lovely days of yesteryear . . .
You are indeed fortunate, geographically. I’m torn. Your advice should be taken. But, rhubarb in a sweet and sour? There is only one way I can mend the tear. That is to try it.